Are hostels safe in Bucharest Romania? You shouldn’t worry. Hostels in Bucharest are as safe as anywhere else. They are usually run by young friendly people with great experience of travelling. Anyway, use the safe deposit boxes and lockers if you want to be cautious, you’ll even find them included in the price of some hostels. What are the safest zones (districts) to book hostels (accommodation)? Go for the central area of Bucharest. Downtown Bucharest is safe, as it is usually crowded especially with young people, students, even at night. Old Town (Old Centre) has additional security designated, as there are a lot of bars, clubs, etc. However, read this safety guide if you are particularly concerned with this subject. What districts should I avoid when booking a hostel (hotel) in Bucharest? Probably it will be quite hard to find accommodation in Bucharest’s less safer zones. If you go for apartment rentals in Bucharest, try to stay close to big squares and boulevards, such as Universitatii Square (Piata Universitatii), Romana Square (Piata Romana), Unirii Square (Piata Unirii), Victoriei Square (Piata Victoriei), Carol I Boulevard, Magheru Blvd., Calea Victoriei, Calea Dorobanti, Regina Elisabeta Blvd., Dacia Blvd. etc. Residential districts in Northern Bucharest and Cotroceni district are also safe, though quite far from main touristic attractions. Avoid Ferentari and Rahova districts if you are looking for a mainly touristic experience in Bucharest, those are areas including some “ghettos” zones with gangs that could turn dangerous especially at night. 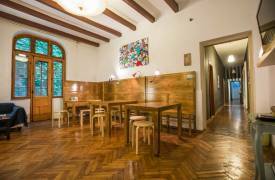 What are the best Bucharest hostels? There is no such thing as best hostel in Bucharest. Of course, you can find your best hostel, the one that suits your travel needs. In order to do that you need to answer some questions, such the purpose of Bucharest trip, your lifestyle and budget and so on. There is a hostels guide in Bucharest we wrote in order for you to find what is best for you. How can I find a central hostel in Bucharest? It is easy. Downtown Bucharest includes several areas of interest, such as nightlife district, cultural sites, shopping areas etc. Check our Bucharest hostel map and find central hostels near Bucharest Old Centre (Old Town), Bucharest’s nightlife district, hostels near cultural sites, hostels close to student area etc. What are the hostels close to Bucharest Old Town (Old Centre)? Those hostels are situated in the Old Town Bucharest or within less than 5 minutes walking distance: Little Bucharest Hostel (situated in the pedestrian area of the Old Town), Antique Hostel, X Hostel, Wonderland or East Hostel. The Old City Centre of Bucharest is situated between two large central squares – Universitate and Unirii. You will also find lots of interesting bars and clubs between Universitate and Romana Sq., so you may also consider The Midland Youth Hostel and Umbrella Hostel which are located near Romana Sq. Also check the hostels in the neighbourhood, but not closest proximity of the Old City Centre: Holiday Hostel, Doors Hostel, Swallows and The Cozyness Downtown Hostel. How much is a hostel bed in Bucharest? Prices for central hostels in Bucharest range from 7 to 12 Euros per bed per night in dorms and from 12 to 25 Euros in private rooms. 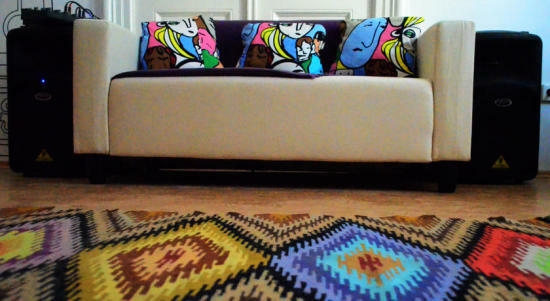 What are the cheapest hostels in Bucharest? Bucharest hostels with good central location, such as Little Bucharest Hostel, X Hostel, Explorers, Doors Hostel, Green Frog, Holiday Hostel etc. offers you beds in dorms starting with 7-8 Euros / night. Are there any central hostels in Bucharest with private rooms? Most of the hostels in Bucharest downtown also have private rooms, some of them including private bathroom. Are there any youth hostels in Bucharest? Most of the hostels in Bucharest are suited for youth travel, offering cheap beds, social rooms and kitchens where you can cook your meals by your own. You’ll also find hostels offering services such as bike rentals, city tours, guided walks or pub crawling. All hostels offer free Wi-Fi, wireless internet connection and even computers to check things on internet and read your e-mails. 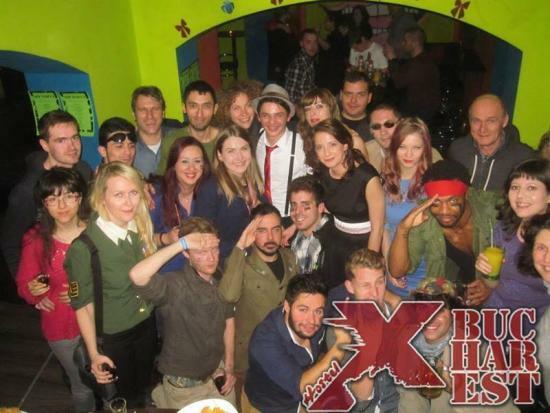 Hostels like Wonderland and X Hostel have their own pubs, organizing events such concerts and parties. Are there any hostels near the Bucharest railway station? The closest hostels to the Bucharest North Railway Station (the main railway station called Gara de Nord) are Oblik The Railway Hostel, Puzzle Hostel, Friends Hostel, Explorers, Green Frog and The Funky Chicken Hostel. The railway station is centrally located in Bucharest, so you’ll be also close to the main touristic attractions, such as monuments and nightlife districts. What hostels are close to the metro station (underground) or public transport in Bucharest? The main central metro / underground stations in Bucharest are Universitate, Romana, Unirii, Victoriei. Most of the hostels in Bucharest are in this area. You can also find cheap accommodation in Bucharest (budget hotels, hostels or apartments for rent near the metro stations Eroilor, Tineretului, Gara de Nord, Stefan cel Mare, Muncii, Iancului and Obor, situated within 5 to 15 minutes to downtown Bucharest. Bucharest hostels map with areas of interest: nightlife, culture, student etc. You can find on Bucharest Tips a map with hostels and their proximity to main Bucharest attractions, drawn carefully by our editors. Hope you’ll find it useful! Are there any hostels in the proximity of malls, shopping centres? You may consider the centrally located hostels for easy access to Bucharest’s shopping avenues (Calea Victoriei and Magheru Blvd.). The closest malls to Bucharest centre are Unirea Shopping Center and Cocor Shopping Center, both situated in Piata Unirii (Unirii Square). Most of the malls are though situated in Bucharest residential districts or outskirts, but they are well connected to the city centre by public transportation. Are there any family hostels in Bucharest? If you are looking for a quiet, more suited hostel for a family with children, we recommend you a hostel in the central part of Bucharest, but not in the Old Centre (Lipscani area). The hostels near Romana Square could be an option, such as Umbrella Hostel, Explorers, Puzzle Hostel. Try a hostel with garden or private terrace where your kids can play, such as Doors Hostel, Swallows’ Hostel, Umbrella Hostel, Friends Hostel, Holiday Hostel, Green Frog, Puzzle Hostel and Peaches Hostel. Bucharest Sleep provides useful information about how to find the best accomodation in Bucharest Romania, hostels, bed and breakfast, budget hotels. Provides guides of how to choose your hostel in Bucharest depending on your interests, hostels on map, contact information and booking as well as reviews and tips.